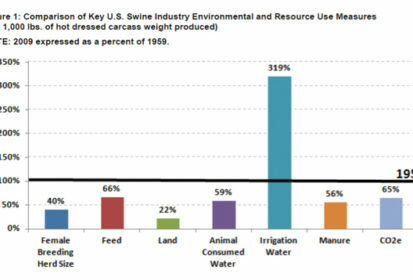 Just how big is the environmental footprint of the Canadian pork industry? There are a lot of opinions but fewer facts when it comes time to try to answer that question. Filling in those blanks is the subject of an upcoming multi-year study by Mario Tenuta, a professor of applied soil ecology at the University of Manitoba, which he discussed at the Manitoba Livestock Expo December 12. Why it matters: Manitoba is a leader in the pork industry and proving the sector’s environmental improvements can help maintain and secure market share. Tenuta is spearheading an environmental footprint analysis (or EFA) of Canada’s pig production industry, slated to start in January. 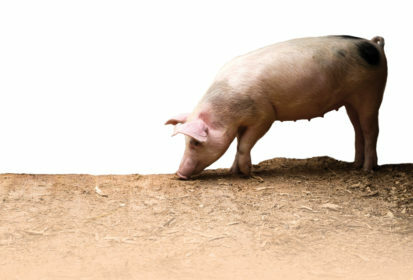 He is looking to mirror the Boyd and Cady “2012 US National Pork Board Environmental Footprint Analysis,” a similar study of the American hog industry that came out six years ago. Tenuta explained that an EFA, in general, is a study designed to quantify the demand for natural resources required for some kind of human activity. He noted that these assessments can be done in scale at a farm level (useful obviously to a producer), but it can also be done at regional, national scale and even at the global scale. 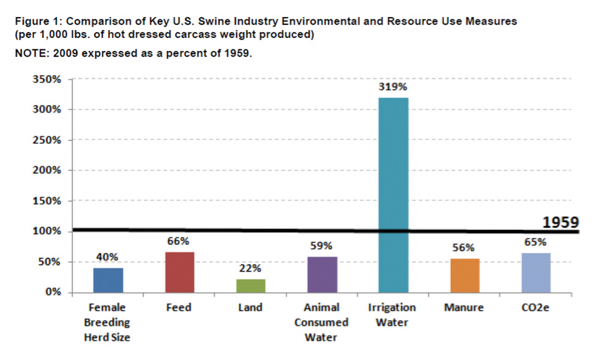 An EFA can consider animal production only (known as “cradle to gate”) or it can consider the animal production all the way to the consumer and all the way to the waste (“cradle to grave”). The 2012 U.S. EFA used the cradle to gate analysis. That analysis compared data from 1959 to 2009 and showed some encouraging progress in the industry. “There has been a tremendous improvement of production efficiencies in the U.S.,” said Tenuta. The American study looked at indicators of natural resource use and production efficiencies and interestingly, they all improved except one: water use in the field, for irrigation (see figure 1 below). Tenuta expects to find similar improvements in the Canadian study. But he noted that Canadian farms don’t rely as heavily on irrigation as American farms do, so he doesn’t expect to see the dramatic increase in water use that the U.S./ study showed. Tenuta detailed a number of reasons that this type of study is important to the Canadian pork industry and who in the industry it benefits. “There’s a pressure on all economic sectors of the economy for the reduction of greenhouse gas emissions in particular, but also energy use, water use, land use, nutrients getting into the environment,” he said. “I break it down to the stakeholders,” said Tenuta. If you’re a farmer, the EFA looks at the demand for natural resources, he said. “So for a pig producer, they could be looking at energy use in the barn; water use in the barn; the amount of feed they’re using; the amount of output of manure; all in relation to what they are marketing,” he said. So for the producer, it’s all about production efficiency. The next stakeholder is the consumer. Tenuta points out that some consumers are interested in the environmental impact of their food choices. “If we can show it’s the case that environmental efficiencies are improving, some consumers will like that,” he said. Then there is the retailers and processors that are trying to exhibit corporate responsibility. They want to know that they aren’t making things worse over time with what they are doing. Finally, there are the shareholders. They tend to drive a lot of what the corporations do in terms of their investments. They are looking for long-term value and growth for their investments.